5am, can't sleep... let's draw up the concept of the Usagi-Yojimbo. Yojimbo turned out to be a no-R no-C amp in the concept (in the signal part at least). Initially I wanted a 2:1 stepdown, if any, in the 26 preamp as it seemed like such a waste. 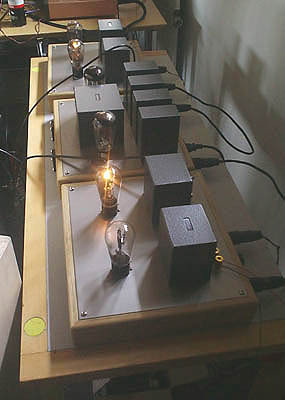 I remember I had a set of Tribute amorphous 1:4 step-up transformers, so I could actually get back the gain of the 26 preamp which now sports a 4:1 stepdown in the output. Best of both worlds? The supply PCBs arrived yesterday and I started soldering the parts on. Two of these will go towards the Prologue 2.0 build for the 12V and 6V heaters, the other two are for future use. I have some toroid transformers laying around that will be used for these supplies. The PCBs are $3.50 each on ebay, better than any breadboard I would cook up. A nice package arrived today with the eTracer kit. Unpacked and started assembling. Found a bunch of µA meters where I had rescaled a few to a more useful range and added my logo for the Assault & Battery preamp. Gotta try that again for my upcoming amps; I'll make a brief project page on rescaling them. So the excuse I used to convince myself to pull the trigger on this is that it is a birthday present to myself. Can't wait to try this thing out; it would eleviate the testing of all the tubes I have here with no info for the used (or are they new) ones. NB: This will allow me to publish accurate measurements on the different VT52 types as well. Ordered a some bias regulator kits and DHT filament regulators from Rod Coleman. The bias regulators will go into the Prologue 2.0 output stage as well as the planned DHT amps at a later date. The filament regulators will be for those same DHT amps, giving me a total of six Coleman Regulators now, a set for each stage. Sort all my tubes I said. It'll be fun I said. On the bright side: I found out I have about 20 different type 26 tubes which might make for a nice photo gallery. Ordered some of Pete Millett's high voltage regulator boards for the same amp so I can get everything quiet; a no hassle amp and I haven't really played with regulated B+ supplies all that much. This will also allow me to get away with using a single choke in the B+ and then branching off to the L/R channels. I don't feel like making complete mono supplies for this little amp, so I'm not going all-out and only using parts that I have on hand (which is a lot, so don't feel sorry for me).